I started volunteering way back. I was a candy striper at the old Elliot Hospital, where my grandmother was a nurse. I was 14, learning how to make beds with hospital corners. In high school, I studied art with Norma Safford, who helped start the Keene Art Association. She thought it was your responsibility as an artist to give back, to give to those who have inspired. That was an early exposure to community involvement for me. I didn’t have a lot of support for going on to college in those days. My guidance counselor said, Well, you shouldn’t be taking scholarships away from boys; they’re going to have families to support. My mother said, You can either get married or go to work. So I went to work as a long distance telephone operator for AT&T, and then about eight months later I got married, which was the wrong thing to do, but it got me out of the house. Two years after I graduated from high school I was in the process of a divorce and had a baby. When my daughter was about two, I enrolled at Keene State, because I wanted find a job that would pay me enough to support us both. It was about 1975, and single women raising kids weren’t really well received. But my daughter, who was in day care, got pneumonia that winter and I had to drop out. But later, when she was in middle school, I went back to Keene State full time, as a nontraditional student. I originally wanted to major in nursing, but my chemistry grade wasn’t good enough to get me a spot in the program. So I was at a loss. Then somebody said to me, Why don’t you think about an individualized major? So that’s what I did – a dual major in the Art and Journalism departments. My idea was that I would get work in graphic design. I volunteered in the community as a student, too, through the Keene Jaycees, which was integrating women into its organization. I was the Jaycee community development vice president for three years. The summer after I graduated, I worked in Brattleboro for Windmill Publications, which put out a number of Town Crier magazines. I worked there as a paste-up artist, and soon became the editor for the Keene Town Crier, and by August I was putting in over 60 hours a week. So I changed tracks and got a job as a dispatcher for the Keene Police Department. I loved the job; it was very varied. You’re answering the phones, and you’re talking on the police radios. You’re entering information into big logbooks. And then you’re also monitoring the cell blocks in the prison. I saw a very dark side of the city, which I was not prepared for. After doing that for five years, I injured the nerves in both of my arms. It put me out of work. I had just gotten married the year before, so there was a little crutch to lean on. But I had to rehab myself, and then I got back into volunteering in the community. I couldn’t lift things; I couldn’t even hold a glass. It was a long time before I could button buttons, snap snaps, all that little stuff. So I just looked for something I could do as a volunteer. For a while, I worked for the Women’s Crisis Center. I did counseling, and I worked at the hospitals to assist victims – things like that. Because of my police work, and because my first marriage was a bad one, I knew there was a need for that resource. I felt like I could make a difference. At the same time I was doing physical therapy at home. When I got the use of my hands back, around 1998 or ’99, my daughter encouraged me to do artwork again. She said, “This is what your goal was, and you haven’t done it.” So I did it. I started out in pastels. Then I wanted to do plein air work – painting landscapes outside. Doing pastels out of doors is not productive, especially if it’s a windy day, or if it’s a moist day or a humid day. I’d go out and spend the whole day painting, and then come back and look at my surface, and the wind had blown everything off of it. It’s powdery. It’s like a chalk, but it’s all pigment and binder. So I decided to switch to oils. I had taken several painting classes with Bob Neuman at the College, so it wasn’t foreign to me, but still it took me three years to get my oil paintings looking to what I thought was equivalent to my pastels. Then I took a couple of pastel workshops with artists at the Sharon Arts Center, and eventually I started teaching there and other places. I also had my first solo exhibit, in 2006, at the Sharon Arts Center, which is now part of the New Hampshire Institute of Art. Now I’ve been teaching a series workshop, Expand Your Creativity, spring and fall semesters for the New Hampshire Art Association. The students work in varied media. They bring their work to the first class, and we talk about how to improve it. Bigger, bolder, change color palettes, change painting techniques. I just want to paint bucolic, peaceful inspiring things. That’s what I want to put on my canvases. 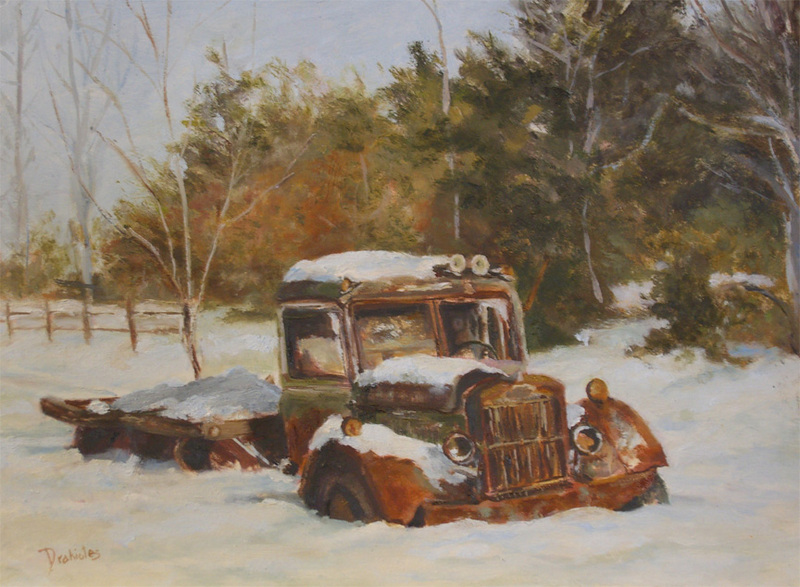 I paint landscapes, animals, and older vehicles in the landscape. I’m drawn to painting old rusting cars and trucks because to me those old vehicles look beautiful. It’s a New England thing. I’ve had so many people say to me they can feel the vehicle has a soul. But I also started an experimental series this summer – pouring acrylic paint onto canvas. It all stemmed from an acrylics workshop I taught. I recently won a Ewing Arts Award, which recognize artists and supporters of the arts in the Monadnock Region. It was a big surprise – it was for my work presenting exhibitions with the Cheshire County Historical Society, which shared the award. I worked with the historical society’s executive director, Alan Rumrill, who’s also a Keene State grad, to curate and host two group exhibits of local artists. The first featured paintings of the Ashuelot River, and the second featured treasured places in the region that are under conservation protection. Next year we will put up a show called All Around Monadnock. The Ewing Award was for creating a new art venue in town. Community work, volunteer work – it spills over. It’s connected to the art. We have a lot of extremely creative people in the area, but not a lot of venues for showing their work. That’s kind of fed me, along with teaching for the New Hampshire Institute of Art. I also oversee the artwork hanging at the Bagel Mill in Peterborough. That’s another one of those volunteer jobs that got defaulted on me when the friend who was doing it moved to the Seacoast. I call art my retirement career. I have some success selling my work, even though it’s not in any galleries. I do commissioned work, and I occasionally sell a piece that’s showing at a local restaurant. The Hannah Grimes shop in Keene sells my paintings. It’s ridiculous, but most of my sales lately are generated by me posting the painting on Facebook. My husband, Dino Drakiotes, is very supportive. He’s a computer guy, a senior R & D technician for Atrium Medical. I’m very proud that my daughter, Fawn Woudenberg, graduated from Keene State, as did her husband. Fawn is an elementary school teacher. My grandson studied at Keene State for two years and is finishing his degree in Rhode Island. And my granddaughter is a junior at Keene High School who is a terrific musician. I didn’t envision that my studies would lead me to a career as an artist, but it’s very fulfilling now that I’m here. I stepped away from art for a while and when I came back to it I had new eyes and new ways to appreciate it. I really like fueling the creative abilities of people in the area, and then giving them the avenues to display their work. It’s all been very healing for me. I was kind of stressed in the circumstances I was in. The minute I started creating my art, my blood pressure came down. I can’t meditate – I’m not one of those people. But I find that I do meditate while I’m painting. It’s the creative process. Just concentrating on what you’re doing, and developing whatever it is you want to portray in that piece of work, it’s a meditative state. It’s been emotionally a good thing for me, and physically it’s a good thing for me, and spiritually, that’s what counts the most.